But let’s get back to 2018, shall we? So what happened over the past 12 months? Now that I’m pretty settled into my niche and freelancing career in general, I feel like this past year has largely been focused on working out the kinks. By ‘kinks’, I mean the things that were a bit less than ideal for me in my day-to-day work. So, no major shifts, just a lot of fine-tuning. A big part of that was building a stronger sense of connectedness and community into my work life. For me, working alone and from home can be deeply isolating (especially in the winter when everything is gray and dreary), so I’ve worked hard to put myself “out there” more and to be less of a lonely hermit. I love my dog Brooks, but he doesn’t talk. Unless he wants lunch. Regular coffee dates with a fellow writer. I’ve known Courtney Westlake for a while now (she’s a freelance writer that lives a town over from me), and she and I have been doing monthly-ish coffee dates at different cafes around where we live. She’s lovely (and really good at getting me out of my office cave!) and I’m so grateful for her company and encouragement. Find you a local freelancer friend like that. Taking better care of myself. I have a tendency to over-work, so this year I tried hard to schedule time for self care activities like a weekly yoga class, hiking, a massage, etc. I even took some half-day Fridays in the summer to get in some pool time. I’ve found that if I *literally* put it on my calendar, I’ll do it. But if I don’t, it gets pushed to the back burner. It’s taken some mental rewiring to make it stick, but so far so good. But that’s not all I did. I also continued to interview a diverse mix of writers and editors for the Yeah Write Club newsletter, including a few pretty well-known names like Erik Larson and Jon Acuff. I love doing these Q&As and hearing how different people tackle their work. If you’re not signed up for that yet, get on it! Volume-wise, work was really busy for me from February-November. I wrote tens of thousands of words for my SaaS/eCommerce clients like Aweber, Manifold, ReCharge, and BigCommerce and had my most profitable year to date. Woo! I'm super grateful to have had some fellow freelancers support me on some projects, which helped me maintain my sanity. 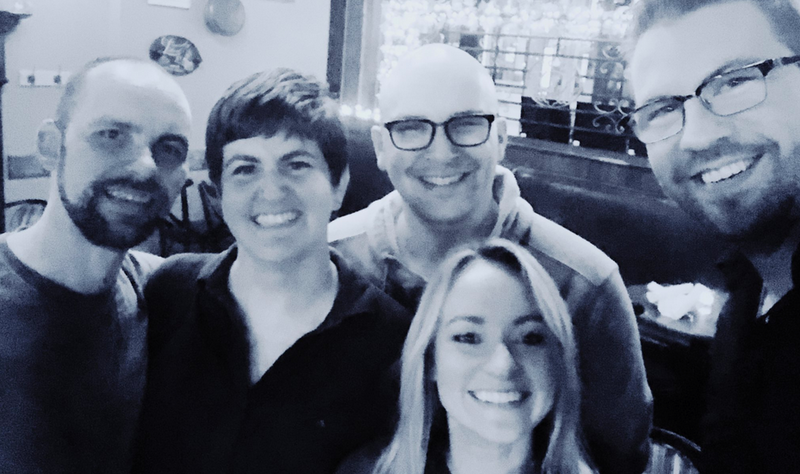 My only conference this past year was Content Jam in Chicago, but while I was there I got to catch up with some of my internet pals IRL (like Lianna Patch, Joel Klettke, and Andy Crestodina.) I also met Jeff Large at the after-event and in November we ended up recording my favorite podcast interview of the year. Look at this blurry photo we took...so great, right!? I had two co-working getaways in early 2018: One in January with Allie Decker down in St. Louis, and one in February with Emma Siemasko in Palm Springs. I love getting one-on-one time with other freelancers who “get it” and these meetups were no exception. It was nice to escape to the California desert in the dead of winter. The Ace Hotel was the perfect spot for us. Brandon and I took some fun trips, with our longest being a road trip to Washington D.C. We ate lobster rolls and went to 12345245 museums while we were there, which was fascinating (and exhausting), but worth it. I stole this photo he took at the modern art museum. On another trip to Chicago, Brandon and I checked out the AIRE ancient baths, which was an awesome experience. Highly recommend. Super relaxing salt baths of varying temperatures, really quiet, everything smells good. 10/10 would do again. Co-hosting my first small retreat. The biggest thing on my list right now is the retreat that Emma and I are co-hosting in April. This will be my first taste of event planning, and I’m really looking forward to it. Along with personal and business development sessions, we’ll have a yoga class, hiking, and dinner with a private chef. CAN’T. WAIT. Very soon I’ll have my *first ever* products available for purchase! This is very exciting and I can’t wait to show you what I’ve been working on. Hint: There will be super useful templates! Did you do a post like this—or do you have an accomplishment from 2018 you’re really proud of? I wanna hear about it. Tweet me @kaleighf.